Frame It All - Simple Modular Sandboxes. The sandbox that grows with you. The Frame It All Two Inch Series 4ft. x 4ft. x 11in. Composite Square Sandbox Kit with Cover provides the building blocks of childhood imagination and discovery. Simple to construct (no special tools required), and easy to maintain. Bold 2in. profile timbers create more perceived value for your landscaping investment. 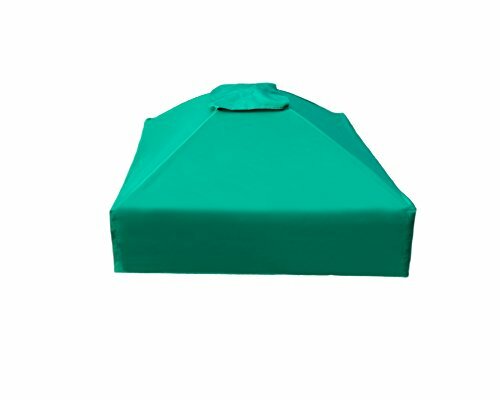 Collapsible Square Sandbox Cover protects your sandbox from rain and debris, or from being used as a litter box by neighborhood cats or other animals. The domed construction prevents water pooling which can help prevent a mosquito breeding ground. Collapsible construction makes it simple to set up or to store away in seconds. Corner connectors fasten the cover securely to the sandbox frame. Velcro flaps prevent animal intruders. When your child outgrows the sandbox, sustain your memories by repurposing the sandbox as a raised garden bed, landscape edging, or integrate with other Two Inch Series Frame It All components.